A new tablet is always a good thing to have. I know a lot of people are already looking at back to school items so this is perfect. Make sure you check it out and enter. 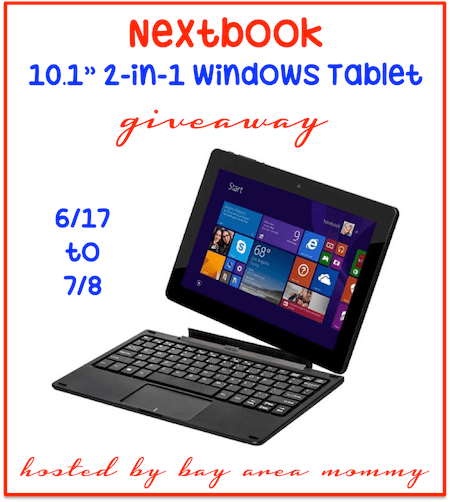 Welcome to the Nextbook 10 Windows Tablet Giveaway! Hosted by Bay Area Mommy and Jenns Blah Blah Blog. Sponsored by Nextbook. For under $250, the Nextbook 10 allows the entire family to stay connected, entertained, and productive with everything they want at their fingertips. The Nextbook 10 is truly a tablet that does more! BUY IT! The Nextbook 10 Windows Tablet is available for purchase at Target for only $219.99. WIN IT! One lucky reader will receive a Nextbook 10.1″ 2-in-1 Windows Tablet! This giveaway is open to US residents only. Must be at least 18 years old to be eligible. Ends on July 8 at 11:59pm EST. Void where prohibited by law. No Purchase Necessary. 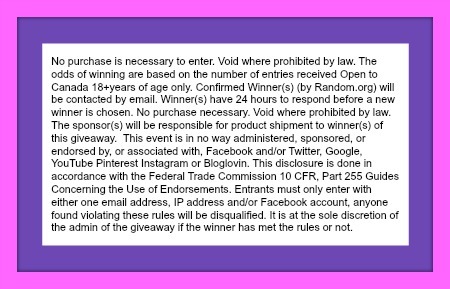 To enter, use the GiveawayTools form below. Good luck! I like that it has bluetooth capability. The detachable keyboard and the touchscreen! I like the touchscreen and the detachable keyboard. Has detachable keyboard, windows 8, compact and all the rest. I would like a touch screen! I love the touch screen & detachable keyboard. Thank you for this giveaway opportunity. We sure could use one in our house. Good luck to everyone. I love how thin it is, and that the keyboard is detachable! I like that the keyboard detaches and I also like that it is a touch screen. I really like that it’s two in one, tablet and a laptop. Opposed to buying two separate devices! And also that it has blue tooth! pretty neat! I love the 10.1″ touchscreen! And that it’s a 2 in 1! I love everything about it. But the 2.0 megapixel front and back seals the deal. wow be fab just not$4 for one kids ..
Gotta be the detachable keyboard! I like the detachable keyboard. Detachable keyboard, camera, and microphone!!! I really like the detachable keyboard. I love the detachable keyboard. It would be convenient when sending emails. a detachable keyboard, 32GB harddrive, front/back camera features … what’s not to like?? I like the amount of storage memory on it. Free year of Office 365 Personal with 1TB OneDrive online cloud storage would come in handy. I like the quad-core processor and the detachable keyboard. Love that it is a laptop and tablet all in one. Thant’s great. i love that its 2 in 1! My favorite feature has to be the 10.1” 1280 x 800 IPS capacitive touch screen, wow!!! that seems so awesome! I like the detachable keyboard feature the best. I love that it is both a laptop and a tablet in one! I love the front and rear camera! Other then the attachable keyboard, I love that it comes with a free year of Microsoft Office. My favorite feature is the detachable keyboard. Love the preloaded VUDU movies and TV app! I love the . 2.0 megapixel front and rear cameras with integrated microphone for skyping with family overseas! Love the awesome 2.0 megapixel front and rear cameras with integrated microphone! I like the detachable keyboard! I love the detachable touchscreen! I love the detachable keyboard and small size! My favorite feature is the Free year of Office 365 Personal with 1TB OneDrive online cloud storage. I think the preloaded Vudu movies and TV apps would be wonderful! I love that it has micro HDMI, USB, and SD ports! The detachable keyboard is awesome! I love that it is a 10.1″ 2-in-1 Windows Tablet. I love that it has Bluetooth and an integrated microphone. I really like that it can be used as a tablet or laptop. Awesome feature. The Preloaded VUDU Movies and TV app; sounds really cool! Most of all I’d love what an improvement this would be over my current netbook which is about 8 years old and barely works anymore. I love how it’s preloaded with movies and TV apps! I’m liking the portability of it and the camera features too. I love that the keyboard can be removed. That feature makes it so versatile! Can I say “all of the above”? Am liking the front and rear cameras with integrated microphone. I like the keyboard canbe removed. I like that it’s preloaded with NOOK and a movies and TV app. My favorite feature is the Quad-Core Intel® AtomTM Z3735G Processor! I like that you can detach the keyboard & it becomes a tablet. That would be really handy. I love the detachable keyboard and the great compact size. I also really like the built in cameras. What a super deal! I love the free year of Office 365 and the 1TB One Drive online Cloud storage. That’s a lot of storage! I like the price,fair battery life,detachable keyboard….and very lightweight for easy travel. I like the detachable keyboard the most. 2.0 megapixel front and rear cameras with integrated microphone for easy picture taking. I love the free year of Office 365 Personal. I like the detachable keyboard and I also like the 2.0 megapixel front and rear cameras. I love that its so compact,But I really love all the fetchers.